With the increasing growth of bandwidth and storage space, along with the proliferation of mobile devices, the information we generate and consume is becoming much more visual. On the content-generation side, multimedia data (image and video) is being generated and consumed at an extraordinary pace. When consumed, one expectation is that complex information will be packaged and delivered visually and enable data scientists as well as business users to interact in real-time with the data. Additionally, visual analytics improves the comprehension, appreciation, trust in, and communication of analytics results and insights for both business and scientific users. As the IBM guest editors for this issue Aya Soffer and Hui Su note, innovative methods, technologies, and systems are needed to manage and extract meaningful insight from this data, due to this continued growth of multimedia content. Similarly, in the area of visual analytics, new systems and techniques are needed to handle large datasets, to allow intuitive interfaces that enable users to explore and interact with Big Data and collaboratively develop new insights. 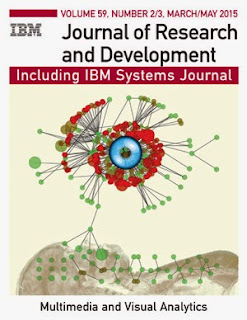 Our latest special issue of the IBM Journal of Research and Development includes papers on a variety of analytics and graphical approaches that facilitate the management, processing, and understanding of multimedia and visual information. Specific topics highlighted in the issue include medical, retail, biometric, and social-network areas, as well as neurosynaptic cores and much more.